Who would have thought that a document as routine and essential as a passport could cause a split in the ruling coalition and set a quarter of the country's heavily fragmented parliament frothing at the mouth? Passports - should they declare your religion? Keeping in line with the efforts of the International Civil Aviation Organisation (ICAO) to introduce global standards for travel documents, the government started issuing machine readable passports earlier this year. So far, according to passport authorities, 300,000 machine readable passports (MRPs) have been issued. The format for the new passports was borrowed from the ICAO and was the same as has been adopted by several other countries. One new feature is that the passports do not include a column to specify the holder’s religion. 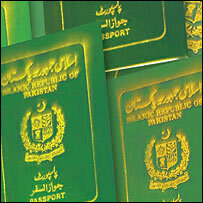 The column had been introduced in Pakistani passports in 1980 by the government of General Zia ul Haq. This apparently routine change in the passport format drew a sharp response from the six-party religious alliance, the Muttahida Majlis-e-Amal (MMA), which won a substantial presence in the Pakistani parliament in the October 2002 elections. 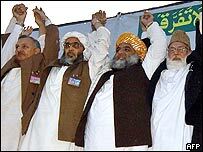 “We feel that the omission of the religion column is an attack on our very identity as Muslims,” MMA leader Maulana Fazlur Rehman told reporters in Karachi last month. He was speaking after an MMA meeting had adopted a resolution calling for the inclusion of the religion column in MRPs. That demand was rubbished by Interior Minister Aftab Sherpao some three weeks later. The government, he told a press conference in Islamabad, had no intention of retaining such a column in the MRPs. So it was a surprise, to say the least, when this week former Prime Minister Chaudhry Shujaat Hussain, who heads the governing PML party, announced that the party wanted the religion column back in the passports. He was speaking after a party meeting attended by, among others, Prime Minister Shaukat Aziz. Mr Hussain’s declaration raised eyebrows all over the country, leaving political observers wondering what had led the former premier to embark on a path that was in clear conflict with Gen Musharraf’s stated agenda of “enlightened moderation”. The alliance argues that the omission of a religious column would allow Qadianis, a minority sect declared to be non-Muslims in the Pakistani constitution in 1974, to travel to Mecca for pilgrimage. “This is ridiculous,” fumes a senior official at the Karachi passport office. Most observers feel that the issue has more to do with the fragility of the political structure pieced together by Gen Pervez Musharraf than with religion. What is being seen as a reconciliation process initiated by the government with the release last month of former premier Benazir Bhutto’s husband Asif Ali Zardari, argue some observers, has left the PML leadership somewhat insecure. As such, they say, the passport volte-face is an attempt by Mr Hussain to demonstrate who is really in charge. “Despite holding no government post, he has demonstrated his control over the ruling party by getting it to adopt a resolution that even the prime minister does not support,” says one observer. It seems to be a classic example of religious orthodoxy finding sustenance from local political compulsions. 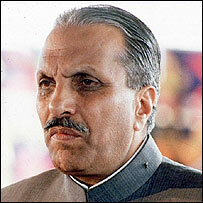 Overt religious symbolism was an essential part of Gen Zia’s strategy for Pakistan’s Islamisation. Even some 16 years after his death, the supporters of his legacy seem adamant not to let religion drop away from public eye at any level. Even as the machine-readable passports controversy continues, there are indications that the government, instead of insisting on its current stance, may relent. There is talk that the machine readable passports may have a page added to them - it would be non-machine readable and give the religion of the holder. In that eventuality, the world may find another reason for looking at Pakistan as a deeply orthodox nation inherently incapable of coming to terms with the modern world. Few among outside observers are likely to understand that such orthodoxy is more often than not driven by political compulsions of weak governments than by any misplaced notions of what constitutes piety.